On November 17, the Safe Chemicals Act of 2011 will come before the Senate Environment and Public Works Committee in a private hearing. It’s a bill that’s long overdue, as was its (rejected) precursor, the Safe Chemicals Act of 2010, also proposed by Senator Frank Lautenberg of New Jersey. If enacted, the bill would drastically reform the country’s current chemical safety legislation—the Toxic Substances Control Act—which, as it stands, is more loophole than not: a system so inefficient that in its 35 years, fewer than 10 chemicals out of 82,000 have ever been restricted or banned. 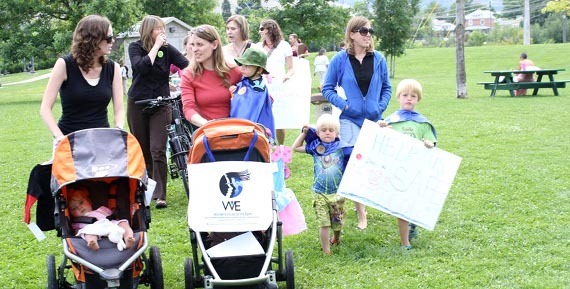 As researchers continue to investigate the breadth of the harm linked to chemicals exposure—from infertility and obesity to learning disabilities and autism—a range of organizations and activist groups are creating a movement for reform. The Safe Chemicals, Healthy Families campaign (SCHF), a national alliance representing over 11 million individuals, includes organizations ranging from Agent Orange Legacy (children of Vietnam War veterans), to Black Women for Wellness, to Consumers Union. But some of the biggest players, the front-line activists from Maine to California and everywhere in between, are moms. There are so many health-focused “Mom Bloggers” that SCHF has a special category for them on its list of members. Many of the blogs have a certain glamour about them, a chic eco-goddess feel. The moms talk legislation and lipstick in practically the same sentence, posting a call for female leadership one day (“Don’t get mad, get elected!”) and makeup endorsements the next (“Top 5 Green Beauty Tips for Fall”). This is Girl Power, all grown up. The mom campaigns include young women, high school and college students, who argue that chemicals exposure can impact fertility—and thus their potential and right to become mothers in the first place. There are a lot of moms out there—it’s a powerful, angry constituency set on protecting their kids from formaldehyde-laced baby shampoo and lead-based face paint. And rightly so. Exposure to chemicals, particularly for children, is a massive national health issue, threatening both bodies and wallets. (Preventable childhood cancer, asthma, neurodevelopmental disorders and lead poisoning alone cost taxpayers around $55 billion per year.) But framing chemicals reform as a women’s issue—a mothers’ issue—opens a door for stereotyping, the idea that these women are over-emotional, looking for a way to fill their days as stay-at-home moms. Worse, the moms’ movement risks being viewed as elitist, a way for Whole Foods soccer moms to find meaning in their idle time. It’s the kind of framing that turns toxic chemicals into a women’s cause—which can, by virtue of its qualifier, be more easily dismissed than, say, a health cause. Or a movement. There are, in fact, men’s groups working to raise awareness about chemicals reform, but much of the men’s activism that I’ve seen focuses primarily on fear of feminization. Skits, speeches and articles draw particular attention to estrogen mimics—chemicals that interfere with hormone receptors in the body—and point out that many deodorants and shampoos contain chemicals that can damage sperm and threaten virility. Chemical effects on the male reproductive system are a serious population-wide health problem, but all too often the real threats of hormonal damage are dismissed by critics. 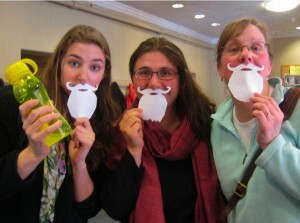 Women in Maine celebrating Little Beard Day. Consider Maine Governor Paul LePage, who, upon learning that the chemical Bisphenol A was an artificial estrogen, remarked that the worst-case result of its use was that “some women may have little beards.” In reaction to this blatant scientific miscalculation (since when does estrogen cause facial hair? ), one might suppose that the state’s men would respond in defense of their own reproductive systems; instead, a thousand women dressed up for “Little Beard Day.” Which, by the way, LePage responded to by suggesting that the women develop a better sense of humor. So, what’s the best strategy? The moms’ movement is strong by force of its numbers, and the anger driving it is appropriate and justified. The trick might be in terminology. Communicative hooks and effective arguments can be most powerful in their subtleties: Let the stroller brigades draw attention to the kids inside the strollers rather than the moms pushing them. Refer to protests not as moms’ events, but as events for kids—rich, poor and everyone in between. Kids are the members of society most deserving of protection, simply because their bodies are the most vulnerable. Activists in Maine have met success with this strategy. The 2010 Kid-Safe Products Act, a statewide chemicals regulation law, passed unanimously because, as one activist put it, “Who can justify voting against safe kids?” After all, there’s plenty of precedent for voting against women’s reproductive health and rights. But children? A different story. Whether or not the Safe Chemicals Act of 2011 makes it to a committee vote, the fight for safer chemicals has a long way a go. But with the right framing, activists can get a lot more bang for their guerilla theater.